Bring a little slice of nature into your workstation with one of our UPLIFT Rectangular Solid Wood Desktops. Available in your choice of size to fit your unique work area, this top pairs perfectly with our UPLIFT electric standing desk bases for a better way to work in stylish comfort. Natural lines and markings in the rustic wood grains make each Solid Wood Desktop different and truly one-of-a-kind, with handpicked selections by our expert woodworkers for the finest desktops on the market. Choose a desktop with a raw barkline edge for an even more natural look to your workstation. And when you buy a solid wood desktop, you can feel good knowing that we'll plant five trees in U.S. National Forests through our partnership with the National Forest Foundation. This listing is for the desktop only. Desktop width 42" - 80"
We offer more than a dozen species of solid wood, along with multiple stain and barkline options so that you can find the perfect desktop for your space. Our woodworkers have years of experience with these woods native to Texas, and have been chosen by us specifically for their speediness and attention to detail. Each desktop is one-of-a-kind, so your finish may vary from what is pictured. The UPLIFT Standing Desk with Solid Wood Top is available in several standard sizes. Choose a depth of 24'' or 30'' and a width of 42'', 48'', 60'', 72'', or 80''. Call us at 1-800-349-3839 if you'd like a quote on a custom size wood desktop up to 96'' wide. Your UPLIFT Solid Wood Desktop can be ordered with square edges on all four sides, and some species can be ordered with a natural barkline on the front edge only or a natural barkline on the front and back edges. Choose to add wire grommets or in-desk power to your desktop. Wire grommets allow for clean and organized through-desk cable routing, or upgrade to the UPLIFT Power Grommet to add two in-desk power outlets to each grommet hole so you can power all of your devices while keeping them close at hand. Grommets are located fifteen inches from the center of the desk, to the left and right. We've found that this allows for the best combination of cable management and accessory use. The wire tray included in the UPLIFT wire management kit was designed to fit between the grommet holes, while still allowing you to mount a full keyboard tray track and modesty panel. 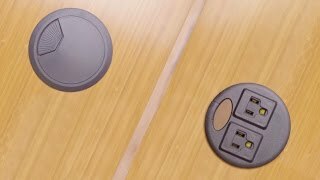 Upgrade one or both to UPLIFT power grommets and have a convenient place to plug in your task light, phone, or anything else you need to keep nearby. The UPLIFT Solid Wood Care Kit includes five furniture polishing cloths, one 16 oz. bottle of Old English lemon oil and one steel wool hand pad. This kit will help you keep your solid wood desktop in tip-top shape for years to come. The UPLIFT Solid Wood Care Kit is available with two Scratch Repair Kit options. If you order the Scratch Repair Kit, you will also receive one 16 oz. bottle of Old English Scratch Cover in addition to the UPLIFT Solid Wood Care Kit. The scratch repair kit for light wood is great for lighter woods such as Maple, Cherry, and Pecan. The scratch repair kit for darker wood is excellent for dark woods like Walnut, Mesquite, and Sipo Mahogany. Please Note: Packaging of the care products may vary. $816.00 List Price: $1,100.00* The list price is the same as the MSRP (Manufacturer's Suggested Retail Price). It may not necessarily be the price at which the product is sold.